Some resolutions may cause crashes due to bundling an outdated DLL; see some resolutions crash the game for the fix. The latest patch for the retail version is the Retail 1.3 Patch. Digital distribution versions already include this patch. Apply the Darkstar One intro skip. If the game crashes delete <path-to-game>\iphlpapi.dll. 3D elements are rendered at a lower resolution. If game has black graphics set in-game FSAA to Off. FSAA. Choose in Options. 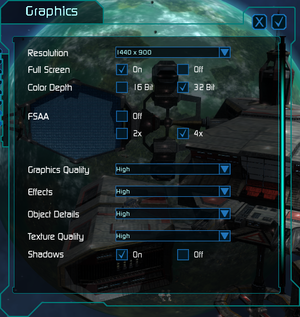 May cause black graphics at higher resolutions. Mouse-based space flight uses a cursor so can't be inverted. Click the red rectangle beside the axis to toggle inversion. Music, Ambient, Effects and Speech. 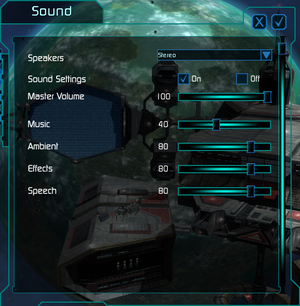 Subtitles available for all dialogue (set under Options, Gameplay). Darkstar One may crash when using certain resolutions due to bundling an outdated version of iphlpapi.dll. Darkstar One will now use Windows' version of this file instead. This is caused by DarkStar One shipping with an outdated version of this file. Darkstar One will now use Windows' versions of these files instead. If your controller's throttle is detected the wrong way around (e.g. putting it at the full speed position makes the ship stop instead) invert the "Throttle" axis by clicking the red rectangle beside it. 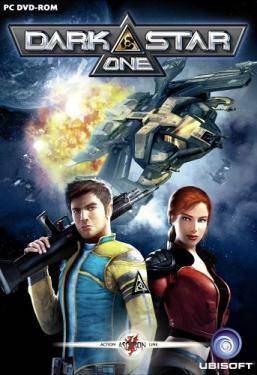 Set in-game FSAA to Off. ↑ 1.0 1.1 File/folder structure within this directory reflects the path(s) listed for Windows and/or Steam game data (use Wine regedit to access Windows registry paths). Games with Steam Cloud support may store data in ~/.steam/steam/userdata/<user-id>/12330/ in addition to or instead of this directory. The app ID (12330) may differ in some cases. Treat backslashes as forward slashes. See the glossary page for details. This page was last edited on 21 April 2019, at 07:59.